Simutrans Transportation Simulator - Download and Play Completely Free! 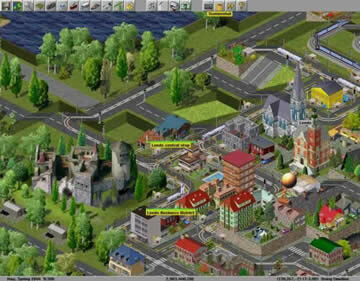 In the world of simulation games, you have built and run cities, farms, theme parks, and even nuclear families. 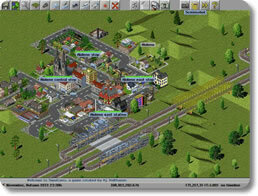 Now, in Simutrans, you will be building something familiar, yet a little different: transportation networks! Roads, railways, bridges, shipyards, airports, all are at your disposal as your new tools of creation! If Simutrans is lacking anything, it certainly is not variety. The amount of things you can build is absolutely staggering. You will never be short of options on how to manage and evolve your in-game industry. Build five different kinds of roads, complete with signs, traffic lights, bus stops and tunnels. Construct railroads, include signal and closing devices, fully integrated control centers, and train stations. Make shipyards, lighthouses, docks, wharfs, and canals for your shipping needs. Plan fully operational airports with traffic control centers, hangars, and two kinds of airstrips. Work your way up to monorails for truly quick and efficient transportation. Alter the very scope of the land to make your transport routes that much more efficient. Remove trees, flatten ground, and raise slopes. The world of Simutrans is alive! Days, weeks, months, and years pass by in game as you play. 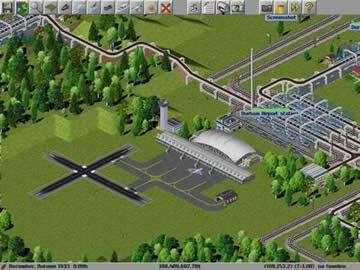 Trains and monorails run to and fro to their stations on the tracks that you have built. Cars drive on roads and highways. Ships roam the seas and dock. Airplanes take off and land on their designated airstrips and fly through the air. Goods and passengers are transported and traded across the map, and once isolated communities become increasingly more connected and wealthier in the process! What’s more, everything grows and develops in real time! You will watch with amazement as those once seemingly insignificant burgs expand into towns, to cities, to sprawling metropolises. Witness an amazingly lifelike economy come to life as people from different areas of the map depend on each other to thrive. But don’t ever get too relaxed, because with growing riches and population comes further complexity! Build even more elaborate and efficient transportation routes with better materials and technologies using the money you earn to keep the exchange of goods moving faster! And just in case you are still skeptical, here is the kicker: Simutrans is completely free! That’s right, you won’t need to pay a cent to enjoy this great simulation game. So give it a whirl, and start working on that railroad! You’ll be playing all the live long day!